To remember, honor and assist our wounded, ill, injured and dying from all wars. Founded in 2004, and received 501 c 3 status on December 5th 2005. The Silver Star Families of America is dedicated to supporting and assisting the wounded and ill and their families. Our goal is to recognize the blood sacrifice of our wounded and illnesses incurred during combat, and remember their efforts by honoring them with the Silver Star Banner. We are also advocates for the Wounded and ill and assist in educating their families and the public concerning their plight. Silver Star Families of America touches the lives of our wounded, ill and families nationwide of all branches of service and all wars. The Silver Star Flag and Banner are symbols of remembrance and honor for those wounded or incurring illnesses during combat while honorably serving in the United States Armed Forces. It may be displayed or flown at anytime, not just wartime, and by families as well as the wounded and ill service members.. It is our wish that all of America never forgets the sacrifice of our service members. The Silver Star Service Flag represents the blood shed by our wounded Service Members from ALL wars. We call it "Silver Star Shining for Sacrifice." "Definition of war zone determined by the Department of Defense"
Any Armed Forces personnel either currently serving honorably or those who have served honorably from any war, who having served in a war zone has been wounded by enemy action or who have been injured or contracted a serious illness that could be rated at least 10% disabled by the Department of Veterans Affairs. All wounds, injuries or illness must have originated in a war zone. Purple Heart recipients, victims of friendly fire, kids injured in a war zone, those who suffer from PTSD, Agent Orange effects and Gulf War syndrome. The individual eligible to receive the Silver Star Banner would not have to be eligible for the Purple Heart or any other military decoration in order to receive a Silver Star Banner. 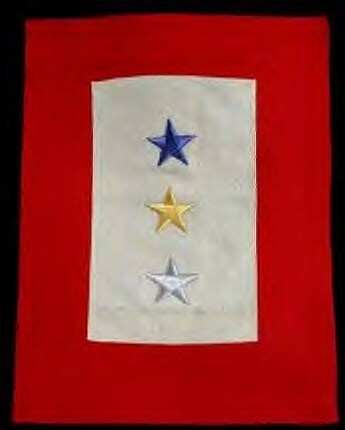 The Silver Star Service Banner may be displayed during peace or war time. The Silver Star Service Flag may be flown by anyone in remembrance of our wounded, ill and dying during peace or war time. It is the wish of the SSFOA that the Silver Star Service Banner and Flag will bring remembrance to the people of the United States of the sacrifices and service of our wounded, ill, injured and dying service members, past and present. It is also our greatest desire for our wounded and ill to see these symbols and know that America has not forgotten them. SSFOA has been organized to provide free services to our Armed Forces wounded, including, but not limited to presentation of a Silver Star Service Banner and certificate. We are different from any other group because we recognize all wounds. SSFOA defines wounded as Military personnel either currently serving honorably or those who have honorably served in the past who receive medical treatment or are diagnosed with an impairment which has altered or will alter that person physically or mentally, to include but not limited to WIA, non-hostile injuries during deployment, or PTSD. The individual eligible to receive the Silver Star Service Banner would not have to be eligible for the Purple Heart or any other military decoration in order to receive a Silver Star Banner.We want to make sure every wounded Armed Forces member, or their families, have a Silver Star Service Flag or Banner. It is our desire that every time someone sees a Banner in a window or a Silver Star Flag flying, that they remember the sacrifice our wounded, ill, injured and dying Veterans have made for this great Nation. Founders and members considered a “purple” star, “red” star, and even a “white” star. Purple of course, came from the Purple Heart. Red would have signified the blood shed and white would have been for the healing of the wounded or illness. As you can see we did not just pull “Silver” out of a hat. Many names were considered before we settled on the “Silver Star Shining for Sacrifice.” Every time someone sees the Silver Star Flag, we want them to remember the blood sacrifice and illnesses suffered by so many for this great Nation. Take a look at the rare picture of a Blue, Silver and Gold Star Flag. This original Banner with all three stars was not well received when we began our mission to include a silver star for our wounded. We were left with no alternative other than starting from scratch. Designing a Flag and Banner, having them manufactured, forming a viable organization and advertising and distributing the Banners.It was a daunting task at times. But today the Silver Star Flag for the wounded lives. Service flags continued to be popular during World War II, and were used throughout the Korean War as well. They fell out of favor during the Vietnam War, but returned to more widespread use during the Iraq conflicts. No National Flag symbol ever materialized for a wounded or ill Soldier even though there was a Flag for Service, the Blue Star and a Flag for our honored dead, the Gold Star. The Silver Star Families of America was born to recognize, remember and assist the wounded and ill of our armed forces from all wars. It is our wish that every time someone sees a Silver Star Banner in a window or a Silver Star Flag flying, that they remember the blood shed for this great Nation, as well as illnesses incurred as a result of combat. The SSFOA was founded on April 11th 2005 and received its 501 c 3 status on December 5th 2005. We designed and had manufactured the first Banner and Flag made especially for our wounded and ill.
We honor and remember our wounded and ill primarily by the presentation of Silver Star Banners, certificates and letters to our wounded and ill. 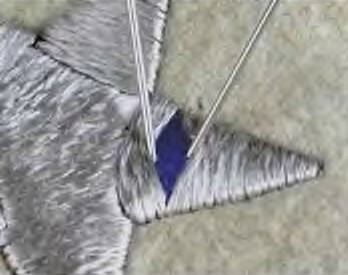 The tradition of the Silver Star for the Wounded dates back to 1917 when people used to sew over a Blue Star with Silver thread to signify a Wounded Soldier. To date we have distributed 1000's of Banners to the wounded and ill of ALL wars. The Silver Star Flag is of the same design as the Banner but is 3’ x 5’. To date we have purchased and distributed 100s of Flags for various military and veteran hospitals, nursing homes, V.A. hospitals etc, including combat support hospitals in Iraq. We also provide care packages to our wounded and various military and V.A. hospitals, a web site where we honor our wounded and ill and a Yahoo Board Forum for the families to talk and trade information. Our mission is to also act as an advocate for the wounded and ill and to educate the public on their plight. For many years Silver was used to represent the wounded. We have brought back this tradition with the Silver Star Flag. Please join with us to remember and honor our wounded and ill.